Hip pain can happen suddenly or slowly over time and is common in all age groups. It can impact heavily on our day to day function and quality of life, interfering with sport, exercise, work and daily activities. It can be affected by wear and tear, fractures, ligament tears and muscle strains. It is also one of the main joints affected by Osteoarthritis. A hip problem can cause pain in your thigh, groin, back or buttock. Similarly, pain you feel in the hip area may be caused by a problem in your back or the sacro-iliac joint in the pelvis. The exact cause, type and location of the pain is always unique to each individual, which means there is no single ‘fix’ for all hip pain. Given that the exact cause of your pain can be complicated, it is important that a thorough assessment is undertaken by your physiotherapist to ensure any underlying issues are addressed. Remember…. where you feel the pain, is not always the source of the problem therefore a proper diagnosis is crucial. If you have hip pain, you may benefit from physiotherapy to help control your symptoms and improve your overall functional mobility. Your physiotherapy treatment will focus on decreasing or eliminating your pain, improving your hip range of motion and strength, and restoring normal functional mobility. 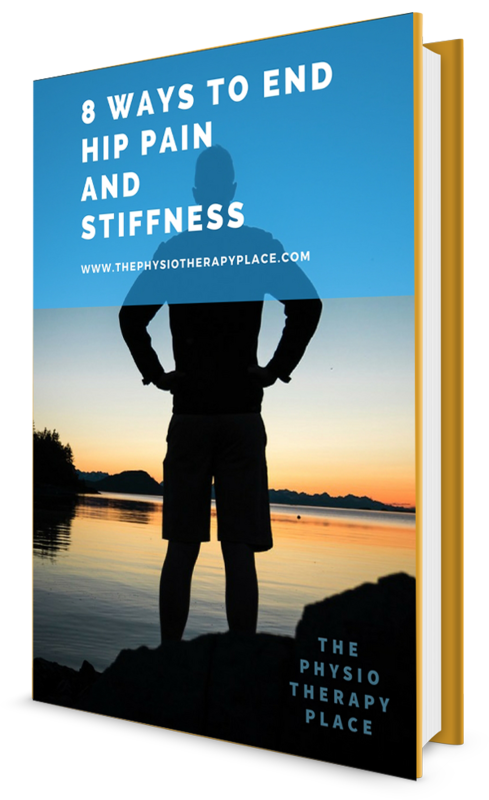 Hip pain and stiffness is a common problem and one that can often linger on for a long time. Some who seek help from their GP will be prescribed rest and painkillers, but most of the time this will not solve the problem. Even if you’ve suffered for months or years and thought nothing could be done, our tips will help you to eradicate your hip pain and teach you how to maintain healthy hips once and for all. At The Physiotherapy Place we will design an individualised treatment programme for you, guided by personal goals and with an understanding of the specific demands of your daily activities. This will help you to learn how to stay healthy and manage the long term physical demands on your body. Only when you know the cause of your pain can you start to work towards a solution. Speak with an expert physiotherapist about your specific case, get in touch to arrange a FREE 15 minute telephone consultation or book a appointment here.